There are many common problems mentioned in the manual. Q:Is the fitness tracker waterproof? A:It is waterproof. 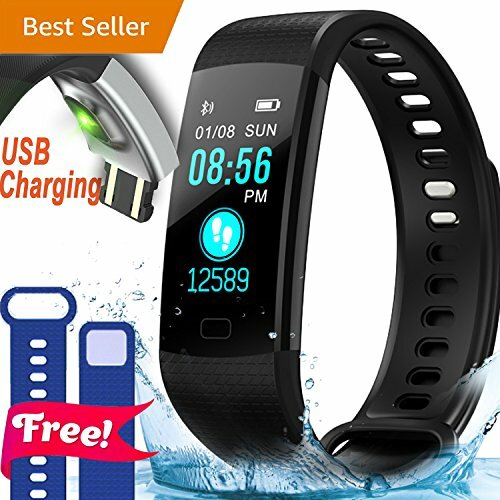 Our fitness bracelet is IP67 waterproof rating. Support for short soaking protection. But for the service life of bracelets, we recommend you not to soak in water for a long time. A:This fitness tracker DOES NOT come with or require a special charger. You simply remove both straps and plug directly into a USB socket on a computer, mobile charger or power bank.And we also give away a free band for replacement. Automatically recognized your status and monitoring the whole sleep progress with analyzing the deep sleep and light sleep hours. When the smart phone is beyond the Bluetooth range, the device vibrates to remind.  LED Color Screen:The fitness tracker watch has a 0.96'' ultra clear color screen,You can clearly see the screen at night or in the glare of the day. It's more temperamental than a regular sport bracelet without color screen. Cool design and colorful screen bring high-quality visual enjoyment.  Heart Rate & Sleep Monitor: Heart Rate Monitor & Sleep Monitor - Adopted newest HR sensor for accurate and effective heart rate monitoring to help you do exercise scientifically;Accurately monitor your sleep quality every night, help you better track calorie burn, optimise intensity of your workouts and you can use the vibration alarm clock to wake you up without disturbing others. ⚡ USB Charging Clip & APP Support:Single Charge(2 hours) will provide you more 3 days' working time; Recommend to download app "JYOU" for a longterm data record and Tracker Function Expansion.Built-in USB plug makes it convenient to charge with any USB block and computer.No charging cable and dock needed.  Compatibility & Warranty: Wider Compatibility -- Download APP 'JYOU',works collaboratively with iOS 8.0 & Android 5.1 above & Bluetooth 4.0 above,such as iPhone7/7 plus 8/8plus iphone X, Samsung Galaxy S6 edge+/S7/S7 Edge/S8/S8+.Once you buy The Fitness Tracker on our store, you will get 24-hour email contact service & 30-day money-back guarantee when the products have any problems.Please refer to the manual before us. If you have any questions about this product by Synmila, contact us by completing and submitting the form below. If you are looking for a specif part number, please include it with your message.